Welcome to the 301 Redirect Website! 301 Redirect Website is a simple service to 301 redirect your entire website to a new host or hosts. Use pattern-matching Rules to redirect large sub-sets of pages to new pages on a different website with ease. MDtravelhealth has hundreds of pages and I didn't want to manually map these out to new pages, as many were blank forum pages, and others needed consolidating onto a single page on in the new site folder structure. So I wrote 301 Redirect Website as an internal tool. Now - I found it very useful so I figured I'd make it available to everyone. I hope you find it useful too! What does 301 Redirect Website do? You can write a set of simple Rules that are matched against pages on your site and result in a redirection occuring. It does this by returning a server command "301 permanent redirect" when the page is loaded. This is a signal to anyone (visitors and search engines) that the page is permanently moved to a new location. So a page like http://mdtravelhealth.com/destinations/africa/angola.php is redirected to https://redplanet.travel/mdtravelhealth/destinations/angola and botswana.php to /botswana and so on - all with just one additional rule. How does 301 Redirect Website work? Simply edit your website's DNS settings to point requests to my server. Then all requests to your site will be served from my server which will return 301 redirect for every one. You can write a set of simple Rules that are matched against pages on your site and a redirected to your new website, or any page you want. You can see an example set of rule above. Pages in the left text column are matched, and redirected to destination pages in the right column. Notice how the last rule is just a *. This means that if there are any unmatched pages at the end of the rules these will be redirected to the final destination (it is recommended you use your new home page or a main index page as shown). How much does 301 Redirect Website cost? If you redirect an entire host to another then it is permanently free. For example redirecting www.widgets.co.uk to www.widgets.com - you only need 1 rule. If you use the advanced rule matching to redirect parts of site to different pages, and use more than 1 rule then I ask for a link. Please just link my site from a prominent page on the destination site of any redirections you perform. If you've not linked-back within a month the system will start to display Ads as it makes the redirections. The Ads have no effect on the Search Engines reading of the page, as the 301 permanent redirect is still issued. Human visitors get redirected after a short interstitial delay, or can click the link immediately. You can either make an XML sitemap and upload that, or you can just redirect the site, make a few basic rules, then wait a few days and check back to see if you missing any rules as all redirects performed are displayed in a Results Map. I recommend using Xenu's excellent XML sitemap export function to build an XMLsite of your site, if you don't have one already. 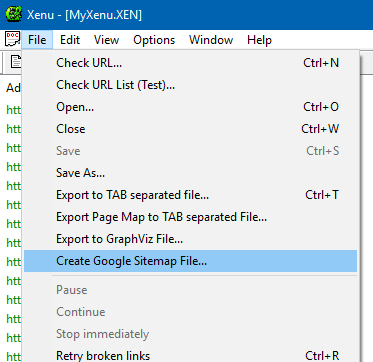 Xenu calls the XML Sitemap a Google Sitemap File. Let Xenu check your site by entering the homepage Url, then go File.. Create Google Sitemap File... This file can be uploaded into 301 redirect website when you Add a new Host. What DNS settings to I need to change? I can't seem to set the apex of my site to a CNAME? You may find it impossible to set a CNAME for your non-www host "mydomain.com". This is a historical problem. It is possible with some DNS providers including Amazon's Route 53 and my recommendation of CloudNS who I use for my DNS (they are a small team and very responsive to queries I've had in the past). Look for ALIAS record instead of CNAME for naked domain redirection. Using that link will also support 301 Redirect Website. I don't want to change DNS provider. What can I do? You can set your mydomain.com A host record to the IP Address of my http://redirector.301redirect.website which is 217.194.214.246 - the only problem with this is, if I have to change the IP address the redirection will fail until you update the record. Keep an eye on emails from me which will inform you if this has to happen. What about moving from www.mydomainname to just mydomainname? Yes, you can avoid a lot of SEO issues and make life simple for yourself by using 301 redirect website to forward all traffic from your www. host to the non-www version, or vice versa. Just set the CNAME records for that host that you want to redirect to redirector.301redirect.website and then 1 rule that redirects everthing to www.mydomainname.com/ or www.mydomainname.com/* (if you want to redirect to the same sub page). It does not matter what server technology your server used or the destination server accepts; Apache, IIS, JSP, PHP, ASP, ASPHX, node.js or anything else. Our server will work with any page and file types - it just redirects everything. Can 301 redirect website forward specific pages on a website to another? Yes, you can "split" the destination of pages to as many different sites as you want. Just make rules or specify individual pages as required. How can I check the redirection is working correctly? First step is to enter the web address in your browser. If it redirects you the correct destination page - it is working. Then you can use a 3rd party service like Redirect Checker to ensure the 301 permanent redirect is being issued. Can 301 redirect website ignore specific pages on a website and yet forward others to a different location? No, this is for redirecting and forwarding an entire site's pages, you cannot pick and choose to allow certain pages to remain. If you need to do this you will have to configure your server pages yourself. You can use a file composer like redirect generator to create files that will redirect individual pages in whatever server technology you need. However if you decide to go for SSL on your site (as recommended by Google), then this might be the right time to do it, as you can use 301 redirect website as all the pages are changing destinations. What about moving from non-SSL to SSL? No, as this is a redirection on the same host, you need to perform this action on your own server. Do you have a demo video to show how the rules and results table work? Sure, just watch this quick demo that will show you some demo rules and how to use the results table to find important redirections you might have missed.